A quick one: tonight (Friday, May 30) there’s going to be a set of special tappings at O’Marro’s Public House. 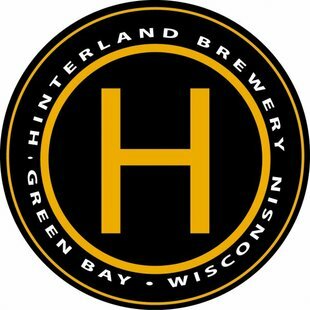 Hinterland Brewing of Green Bay will be rocking Shawn’s house with kegs of their incredible Grand Cru, a Belgian-style strong ale, and White Out, their bourbon barrel-aged double IPA. A member of the Hinterland crew will be on hand and The Haymes Band will be letting it rip. The big beers start flowing at 7 p.m. Mention sour beer and people tend to think of Belgium. 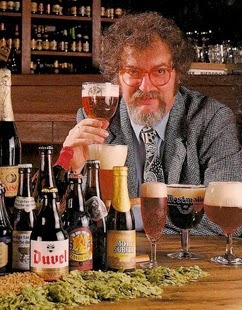 But sours have never been exclusive to the Belgians. Every great brewing culture has, at one time or another, made a place for acidic beers on their bill of fare. English porters of the 1800s were known to be quite tart and in Germany there were a host of sour ales that were once popular regional styles. In America, sour beer is thriving and today we have a couple of Midwest-made sours that take their cue from the Deutschland of old. It’s back and, once again, it’s nearly perfect. I quaffed a lot of this last summer and hope to do the same this year. This is a gently sour wheat ale based upon the Berliner Weisse style that was all the rage in 19th century Berlin. The beer pours to a hazy straw color under a voluminous head of stark-white foam. A bright, lemony aroma races up from the cup and follows into the sip. This is an especially effervescent beer with a palette of fruit (green pear, green apple, white grape) flavors that come rushing by and then get swept off by a refreshing tartness that makes for a crisp clean finish. For warm-weather drinking, there’s just nothing better than this. New Glarus doesn't list the ABV on the bottle, but I’d be surprised if it’s more than 4%. Berliner Weiss is currently available in 4-packs of 12 oz. bottles at Gardina's and at the Jackson St. Pick 'n Save. I imagine it won't be long before you see this popping up at a few of the other beer depots around town. Here’s something I’ve never tried before. Hell, I haven’t even heard of this sort of beer before. According to Schell's website, this is “a Märzen Weisse. There is very little information that remains about this beer, as it has been extinct for many years now.” We’ll have to take their word for it (for now). Regardless, this is a delicious beer. It drops from the bottle cloudy and brown with a big, rocky head of khaki foam. A sweet, milk-sour aroma hovers over the glass that's interesting enough to stop you for a moment before diving in. The mouthfeel is light, but creamy with the flavors see-sawing between sweet and sour. It reminds me of a tart jam made from sweet, dark fruits. The sourness is easy going, but firm enough to balance the beer. This would be a great beer for the next time you want something complex, but not overbearing. At 5.4% ABV it’s appropriate for anytime of day. The only place you’ll find this anywhere near here is at Gardina’s where you'll see it in the packaged beer section in 750ml corked and caged bottles. A final shout about Beer Hunter night in Oshkosh. This Thursday, May 29, will be the Wisconsin premier of Beer Hunter: The Movie at Time Community Theater in Oshkosh. The movie starts at 7:30 p.m. Admission is $5 and there will be good beer available at the theater to purchase and enjoy during the movie. A couple hours before the movie, Gardina’s Wine Bar & Cafe will host a five-course, Beer Hunter Beer Dinner. Gardina’s is just across the street from the Time. The Beer Dinner is $38 per person. That price also includes a ticket to the movie. Dinner begins at 5:30 p.m. and reservations are required. Reserve your seats by contacting Gardina’s at (920) 231-3516. View the full menu for the beer dinner HERE. Hope to see you all, Thursday! Here’s a minor masterpiece that appeared in the Daily Northwestern on Memorial Day, 101 years ago today. Our friends at the Oshkosh Brewing Company suggest that after a bout of dampening exertion, we replenish our vital bodily fluids with their “stimulating” beer. get a brew of high quality. This happy babble isn't all balderdash. Science says it’s true. Still, does shooting pool really count as exercise? The way I play, it does. The endless pacing around the table as I miss one shot after another always leaves me in need of moisture and calling for beer. We have a holiday weekend approaching us, friends. You’re going to want to drink some beer. Let’s be honest, you might want to drink a lot of beer. If that’s your camp, you’ll need a beer built for the long haul. Something companionable you can slurp throughout the day as you think about the yard work you’re not doing. This doesn’t mean you have to resort to Pabst. 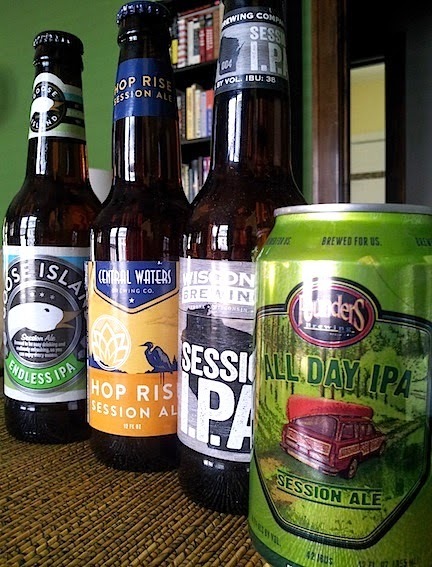 There’s now a fairly decent selection of session IPAs that are easy to find in Oshkosh. Session IPAs are lower in alcohol (5% ABV and under) and less bitter than the standard IPA. Sounds like a pale ale to you? It’s not. There’s none of the balance of that style. Session IPAs tend to have heaping additions of hops at the tail end of the brewing process. Those late additions give the beer a hop flavor and aroma that dominates its profile. We started seeing a few beers in this vein come to town last year. This spring and summer we’ll see a pack of them. Enough of the prattle, let’s taste some beer. Here are four session IPAs you can pick up on in Oshkosh. Of the four beers here, this one would be the best pick for the IPA fan who craves bitter. Light bodied with a pungent, grassy aroma this beer delivers the most bitterness of the bunch. The hops come across as mostly citrus and pine and you can just forget about the malt. Very refreshing at first, but the bitterness tends to build. That’s not necessarily a bad thing, if that’s your thing. Hop Rise Session Ale is 4.5% ABV. Here’s the beer that really got the whole session IPA trend going. And it comes in cans. I like that. The aroma of this beer is huge. Again with the citrus and pine along with a dollop of pineapple that gets somewhat catty as the beer warms. There’s a light, sugary malt flavor that doesn’t save the beer from being somewhat thin on the palate, but that’s entirely appropriate here. This beer is eminently drinkable with a beautiful, juicy hop flavor and almost no residual bitterness. This will be a great one for summer. All Day IPA is 4.7% ABV. I’ll spare you my snide comments about Goose Island and their loathsome parent company and get right to the beer. Here’s another ale with a beautiful aroma and one that’s unique. A wafting floral scent – think fresh cut roses – oozes from the beer. The flavor is light and fruity, lemony even, with a grainy bit of malt lurking behind the mellow hop flavor. The beer finishes exceptionally clean. Overall, it could use just a bit more oomph, but it’s not bad at all. It’s certainly quenching. Endless IPA is 5%ABV. Here’s the most balanced beer of this flight. The aroma is a pleasant mix of honey-like malt and earthy hops. A persistent pine note threads through the toasty malt flavor making this beer less of a one-trick pony than the others. It also has the most body of the bunch, though it’s still quite light. This seems to takes its cue from the malt-balanced, Midwestern IPAs that were popular before the West Coast style became predominant. I’m starting to think this might be something like the Labatt’s IPA they were drinking in Oshkosh back in the 1950s. In any case, this would be ideal for an extended session. WBC’s Session IPA is 4.8% ABV. You’re likely to see most of these beers at the standard depots, but when all else fails, head to Festival Foods where you can find them all in the same place. Have a great Memorial Day Weekend! The tenth edition of Gardina’s Beer Bar Series is set to flow tonight (Tuesday, May 20) at 6 p.m. with a firkin tapping of O’so Brewing’s El Dorado SMASH IPA. A SMASH beer is made from a single malt and a single hop with the recipe typically designed to highlight the unique flavor of a specific hop varietal. Now, O’so being O’so, they went ahead and unSMASHed their SMASH beer by dry hopping it with a second hop, centennial. This is an aroma hop with a clean, lemony scent. That ought to work well with the El Dorado. You can decide that for yourself tonight at Gardina’s. If you travel down Bayshore Dr. in Oshkosh today, you find a serene residential neighborhood that reveals not a hint of its beer-soaked past. But beginning in 1850 and going well into the 1880s, the neighborhood between Bowen and Eveline streets was host to three breweries and at least one saloon. Today, I want to take another look at the little brewery that was on the south side of Bayshore Dr. just west of Eveline St. The brewery was owned by George Loescher and was known simply as the Oshkosh Brewery. I wrote about Loescher’s brewing exploits in Oshkosh HERE, but not long ago I came across some new material that gives a better glimpse into his operation. In 1872, George Loescher and his wife, Regina, leased the Oshkosh Brewery to their son Leonard Loescher and a man named Andrew Ackerman. The five-year lease was recorded by the Winnebago Country Register of Deeds on April 8, 1872 and a copy of it still resides at the Deed’s office in volume 77 of land records. The document holds some interesting nuggets about the brewery. Thrilling, don’t you agree? Is for me. Let’s unpack it. So, Loescher had 87 kegs on premise that could hold approximately four gallons of beer, and just 18 quarter-barrel kegs that held 8 gallons of beer. That’s not much keg capacity to run a brewery with. Perhaps there were more kegs already in use by saloons in the area, but you would expect there would have been some mention of that in the lease. Then again, perhaps Loescher wasn’t relying on the saloon trade to keep the brewery afloat. The lease indicates that he was operating a saloon in conjunction with the brewery. Loescher may have had been selling most or all of his beer in house. This is the first mention of Loescher’s saloon that I’ve seen. His saloon isn’t listed in any of the Oshkosh city directories of the period, but it’s not too surprising to find that he had one. It wasn’t at all unusual for breweries of that time to sell their beer on premise. One more thing: that deal about the lager beer cellar. The lease doesn’t give its location, but it mentions a road leading up to it. Where was that? 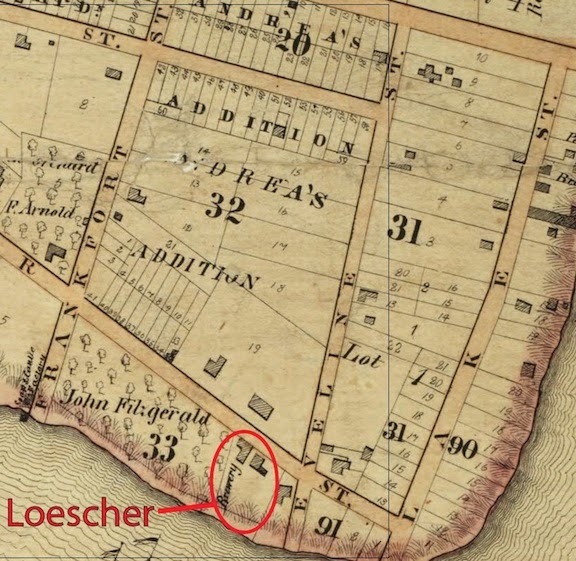 Loescher owned a number of properties around the brewery; it’s possible his aging cellars may have been located off-site somewhere nearby. There’s a good chance remnants of that cellar are still in the neighborhood. Wouldn’t that be a lovely find. I think a dig is in order. I have more on Loescher, but that’s enough for today. I’d hate to over excite you. Here’s a duo of blistering ales that’ll send a thrill through the bitter hearts of the lupulin freaks among you. If you’re not keen on scouring your palate with the juice of the hop, look away... look away. 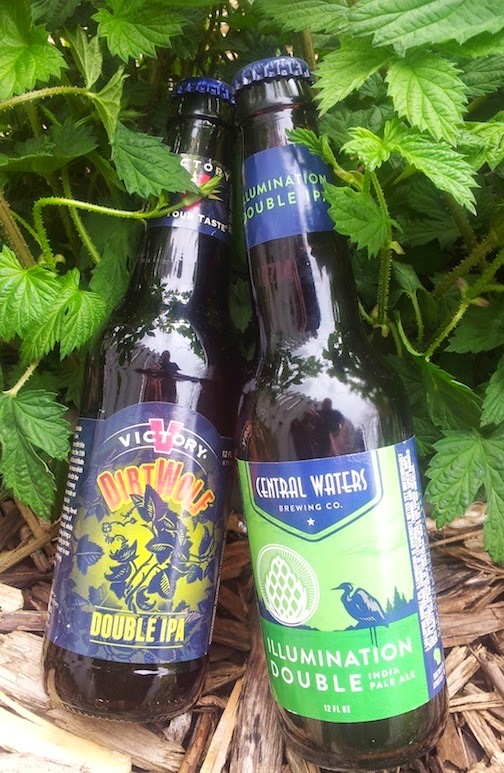 Both these devils are now available in the packaged beer section at Gardina’s. Here’s an especially stinky thing from our friends at Central Waters of lovely Amherst, WI. This one is also well named. After a bottle or two of this you’re going to feel rather illuminated (as in lit up; it’s 9% ABV). This seasonal beer is well known around here and this year’s vintage will surely please its fans. This beer is even wolfier than DirtWolf with everything about it seeming to be a bit more. It’s a shade or two darker than DirtWolf pouring to a handsome gold under a slender cap of white foam. The aroma is a treat. Again with the pine, but with some pineapple and a sweet underpinning of candied fruit. This beer also starts throwing up cat box as it warms. Everything but the urine carries over into the flavor and then gets beaten to a pulp by the beer’s incredibly aggressive bitterness. Damn! But there’s a creaminess, almost silkiness, to the beer that works well with its sharp, bitter quality. Nice trick, there. You don’t need me to convince you. If this is your poison, you already know that you’re going to be drinking this soon. Gardina’s is the only place I’ve seen it in town, so far. It’s selling there in the packaged beer section where you can pick up a sixer for $13.99. A couple days ago, I posted THIS about the hop-forward beer the Oshkosh Brewing Company was making in the early 1900s. 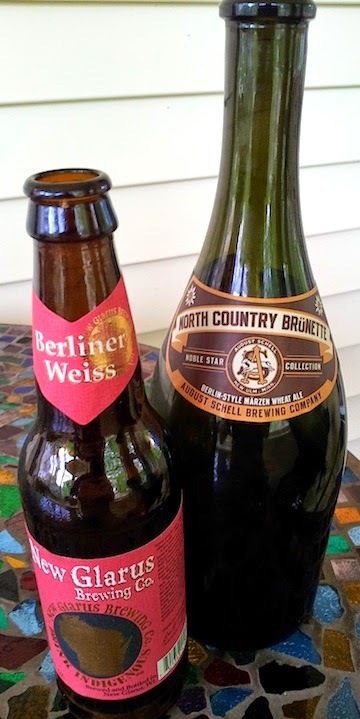 After I’d posted that, it dawned on me that there are a couple of beers floating around town at the moment that resemble the pre-Prohibition lagers OBC was brewing. Of the two, the example I like best is Champagne Velvet. It’s currently on tap at Gardina’s and will be hitting the Oblio’s draught line-up in the near future. It’s brewed by Upland Brewing Company of Bloomington, Indiana. According to Upland, the recipe is based upon handwritten notes found in the basement of the old Terre Haute Brewing Company. The notes were dated 1901 and were supposedly made by an assistant brewmaster at Terre Haute. That brewery dates to the 1830s and was the maker of Champagne Velvet until the brewery closed in 1959. Got that? Anyway, the Champagne Velvet Upland is now making seems damned close to the sort of beer the Oshkosh Brewing Company was producing in the early 1900s. It’s a pale-gold beer with a grainy nose complimented by an herbal hop aroma. There’s a slight corn sweetness to it pinned under a firm bitterness that threads through the beer from beginning to end. This is precisely the sort of stuff the father of your father’s father was drinking. Another beer in the same vein is Batch 19. This is a MillerCoors product first released in 2010. Here’s another one where the recipe was supposedly found in the basement of a brewery, this time at Coors in Colorado. Batch 19 is similar to Champagne Velvet, though more restrained. It goes easier on the hops, but there’s still enough bite there to separate it from today’s macro product. Where they go wrong with this beer is in the carbonation. It’s so over the top that it gives the beer a harshness it wouldn’t have had they deviated from their standard practice of overcompensating for the lack of flavor their beer’s typically have by blasting them with carbonation. Still, it’s a decent lager and window to what beer used to be prior to Prohibition. You can pick up Batch 19 all over town. 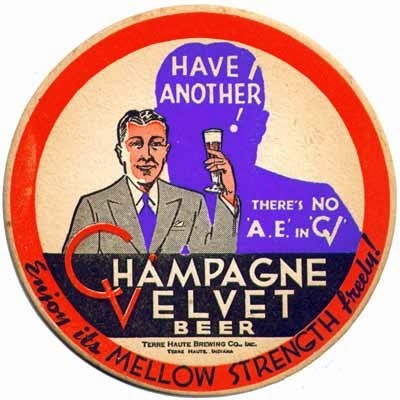 But if you can, go for the Champagne Velvet. It’s the better of the two. Did you know this is American Craft Beer Week? Of course you did. For nine years running, the Brewers Association has highlighted a week in May to encourage people in the good-beer trade to do something special in celebration of the small and independent brewing movement. At Fratellos in Oshkosh they’ll do a couple of things to mark the occasion. First, they’re having a keg swap with Red Eye Brewing of Wausau. All week long, Fratellos will have Red Eye’s Dopplesticke Altbier on tap. This is a big, malty, German-style brown ale. Red Eye makes some great beer. If you haven’t had a chance to check out their stuff, this is a good way to do it without having to drive to Wausau. 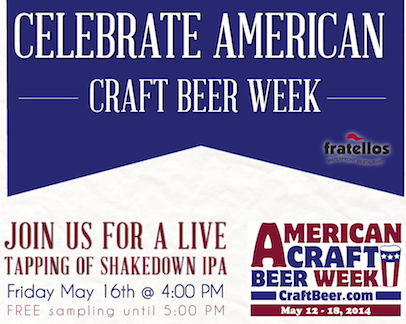 Then on Friday (May 16) at 4:00 pm, Fratellos will tap a batch of Fox River’s Shakedown IPA. This is a single-hop, 7.1% IPA that’s long on simcoe, a hop that delivers a flood of pine and citrus flavors. They’ll open the tap on that and offer free samples until 5:00 pm. Can’t beat free. Happy Craft Beer Week! Each May, I tend to have hops on the brain. Can’t help it. I’m being influenced by the garden in my back yard, where for the past week the hop plants have been adding 4-8 inches of new growth a day (have a look HERE). So, of course, bells started going off when I came across this simple ad. It’s about “That delicious hop flavor found in Oshkosh Beer.” This appeared in the Oshkosh Daily Northwestern of May 20, 1908. Hop fever in May is nothing new. That bit about the “spicy flavor” of the beer makes sense. OBC at this point was sourcing its hops from Oregon and Bohemia (now part of the Czech Republic). The Oregon hops were almost certainly cluster, which the brewery probably used for bittering. The Bohemian hops were saaz, the classic, noble hop known for its spicy flavor and clean bitterness. The result was a Classic American Pilsner of the pre-Prohibition variety. It was a unique style of American beer, now rarely encountered. The beer was made from malted barley – comprising 70-80% of the grain bill – with the remainder of the grist being corn. The malt flavor would have been subdued; just enough to support the beer’s pronounced hop flavor. Sounds not unlike what American brewer’s are trying to achieve these days with their IPAs, though the hop flavor would have been quite different. Hoppy beers began falling out of favor with American drinkers after Prohibition, yet the Oshkosh Brewing Company maintained its propensity for producing a hop-forward beer. Well into the 1950s, OBC’s Chief Oshkosh Beer was still being described as “sharper” and more bitter than others. This would have been especially true in comparison to the beer of its cross-street rival, Peoples Brewing. In that respect, the two Oshkosh breweries managed to create an equilibrium. Peoples Beer was favored by Oshkoshers who preferred a maltier lager. Chief Oshkosh was the choice of the city’s mid-century hop heads. If you were stepping up to the bar at Witzke’s in 1957, which would you have chosen? A quartet of beer here, let’s unpack the party at O’Marro’s first. Tomorrow evening (Friday, May 9), O’Marro’s Public House will kick off the weekend with a couple of limited edition IPA tappings. At 7 p.m., they’ll tap into kegs of 3 Sheeps Nimble Lips, Noble Tongue Vol. 1 and Southern Tier 2XONE. The 3 Sheeps beer is an oak-aged IPA that gets a final addition hops just before it goes into the beer barrel. Next to that will be 2XONE, an 8.1% SMASH (single malt, single hop) beer that’s loaded with mosaic hops. These are a couple of rare beers, so taste them while you can. More IPA! 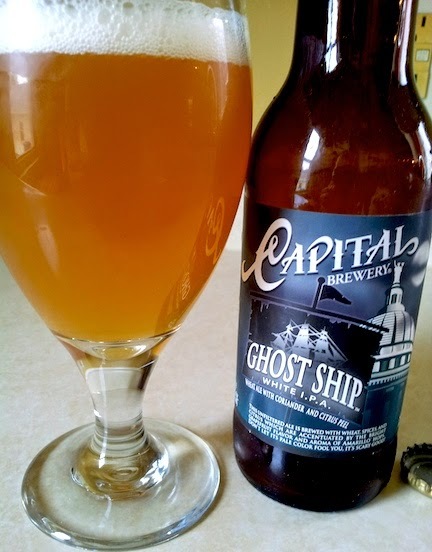 Ghost Ship White IPA by Capital Brewery landed at Festival Foods in Oshkosh at the end of April. This is an odd-ball beer and it's quite good. Ghost Ship is a mash up of a Belgian whit with an American IPA. You get just what you’d expect from the whit end of things: the beer is pale and cloudy, with a lot of citrus and spice in the nose. Then come the hops. The beer has a juicy, lemony flavor that marries nicely to the whit-beer base. There’s enough bitterness here to please a hop head, but it fades from the tongue almost before you’ve set the glass down; making for a surprisingly clean finish. A tasty, interesting beer and at 5.6% you can enjoy a couple without being too altered. Capital says they’ll be canning this beer come May, which would make this a good choice for outdoor drinking as the weather warms. Enough of the hops, already. Big Buck Brown Ale from Black Husky Brewing is another surprising beer. Ostensibly an American brown ale, this goes in a whole other direction with the addition of maple syrup. It looks like a brown ale with its deep-red hue and tan crown of foam, but the aroma tips you off that there’s more than a brown in the offing. Fumes of sweet caramel, toffee and maple come drifting up. The flavor is rich with malt and just slightly sweet with a creamy mouthfeel that reminded me of a Belgian dubbel. In fact, the more of this I drank, the more I started picking up on that dubbel aspect. It has some of those same raisiny, dried-fruit flavors that you encounter in a dubbel along with a similarly dry finish. This is an excellent beer. At 8% ABV it’s not too big, but certainly big enough. The only place to get this anywhere around here is at Gardina’s in Oshkosh where in the packaged beer section 22 oz. bombers are going for the nice price of $6.99. Can’t beat that! Last weekend I ran into several people saying good things about the maibock that’s pouring at Fratellos here in Oshkosh. No way I was going to miss that. I drained a growler of it on Sunday. It’s fantastic. The beer pours out medium gold with a creamy, white cap of suds. The aroma is clean and malty with undertones of fresh bread and hay. This is a full-bodied lager with a rich malt flavor. A friend told me he loved the “unusual toastiness” of the beer. I’m with him on that. There’s plenty of Munich malt in the grain bill giving the beer a toasted-bread character. What won me over, though, was the firm, peppery bitterness of its finish. I like a maibock that doesn’t hide its hops, and this one makes good use of its spicy, German hops. They lend the beer a brisk, refreshing finish that makes you immediately want more. At just over 6% ABV this is a beautiful, warming beer; perfect for this cool spring we’re having. The May edition of the Oshkosh SCENE is now out and available all around town. This time for the Oshkosh Beer Garden, I wrote about the surging popularity of India Pale Ale in Oshkosh. And while I was working on the story, I began to wonder: what was the first IPA to arrive in Oshkosh? I started digging expecting to find that IPA had been flowing into Oshkosh prior to the 1900s, but found nothing confirming that. That’s not to say that Oshkoshers weren’t drinking IPAs in the 1800s, it’s just that I haven’t been able to locate anything that explicitly says so. Frankly, I’d be surprised if there wasn’t an IPA or two being served in Oshkosh by at least the 1880s. Though lager beer dominated in this city, we were also getting a healthy assortment of English styles prior to the turn of the century (examples HERE, HERE, HERE & HERE). We know that Scottish brewed IPA was coming into Wisconsin by the 1850s. We also know that in the 1880s IPA was being brewed in Wisconsin at the Todd Brewery in Janesville. I’d bet some of that beer was finding its way to Oshkosh. The Labatt’s IPA Thiessen was selling was brewed by Labatt Brewing in London, Ontario, Canada. By the time its IPA reached Oshkosh, Labatt had been brewing it for nearly a century. The Labatt’s IPA was said to have come into being in the 1860s after the son of the brewery’s founder returned home from a brewing apprenticeship in Wheeling, West Virginia, where he had picked up the recipe. The beer became the brewery’s flagship brand and by the 1890s accounted for almost 75% of Labatt’s output. How did the 1956 Labatt’s IPA taste? Labatt Brewing was known to use American hops, but certainly not in the quantities used in the kind of IPAs that are now so popular. Today it would probably more closely resemble a modern pale ale, than it would an American-style IPA. Still, this would have been a substantial beer and especially so in 1956. 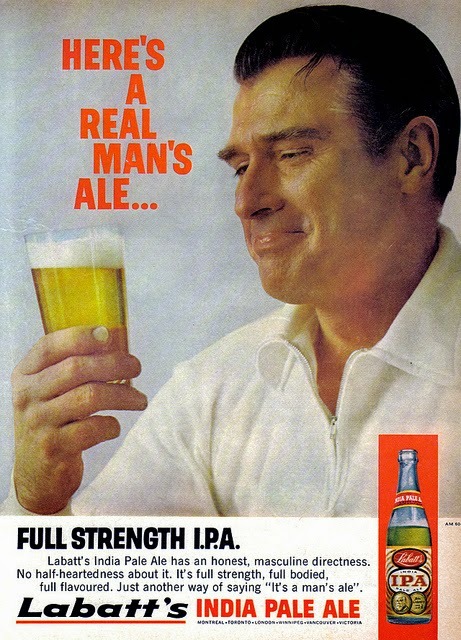 Ads for Labatt’s IPA of the 1950s sold it as “A real ale brewed for men who enjoy the natural tang of hops” and stressed “it’s hearty strength.” Sounds kind of good. Sadly, it’s no longer being brewed. In 1995, Labatt Brewing was scooped up by Interbrew, which subsequently became part of Anheuser-Busch InBev. Another sad end to a once-great brewery. 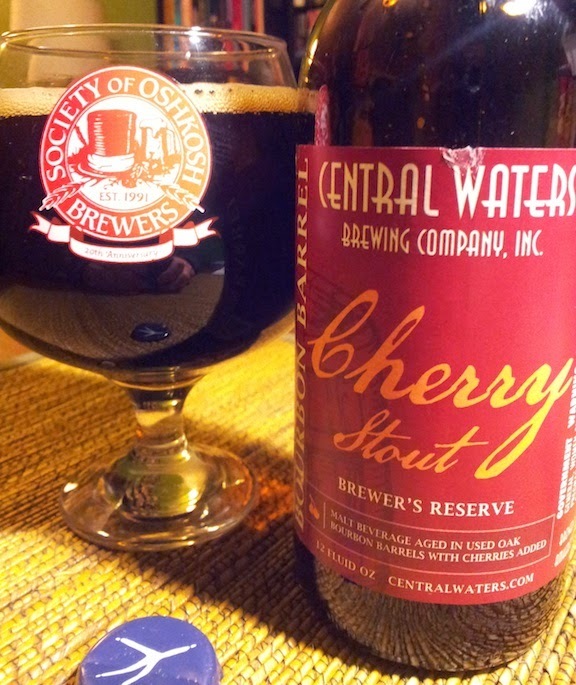 What: Central Waters Brewer's Reserve Bourbon Barrel Cherry Stout. An imperial stout aged for six months on Door County cherries in bourbon barrels. The ABV is not listed on the bottle, but I’d estimate it to be somewhere near 10%. Where: Festival Foods in Oshkosh sells 4-packs (12 oz. bottles) of Bourbon Barrel Cherry Stout for $12.99. Why: The aroma is reason enough. The beer gives off a dense gust of bourbon mingling with cherry hard-candy and angel fool. It’s a delicious smell. And I’m getting ahead of myself... The beer pours dark ruby with a flimsy sheet of off-white foam that falls to pieces quick as a lick. It’s not the most beautiful beer you’ll cup this weekend, but that heady aroma makes up for it. As does the flavor. The cherry note here is a fat one that blends seamlessly with bourbon booziness and oak-barrel tannins. That blend lends the beer an acidic, wine-like tartness that makes it somewhat refreshing – the last thing you’d expect from an imperial stout. This beer is definitely a breed apart from the other barrel-aged beers Central Waters produces. Their Brewers Reserve series is known for its opulent, chewy beers. That’s fine, but they have a tendency to grow ponderous about half-way down the glass. Not this one. And the lighter mouthfeel doesn’t come at the expense of flavor. The result is a beer that’s overtly complex, yet still inviting.